Looking for ideas of things to do during the holiday season in Asheville and western North Carolina (including Thanksgiving, Christmas and New Year's)? We have plenty of vacation ideas for a getaway. The area is definitely one of the best places to shop for the perfect gift since it's home to so many talented artists. Find plenty of festive events. Remember, weekends are always busiest, so make reservations well in advance. For better deals and fewer crowds, stay Sunday-Thursday nights. Pic above: Downtown Asheville lights. 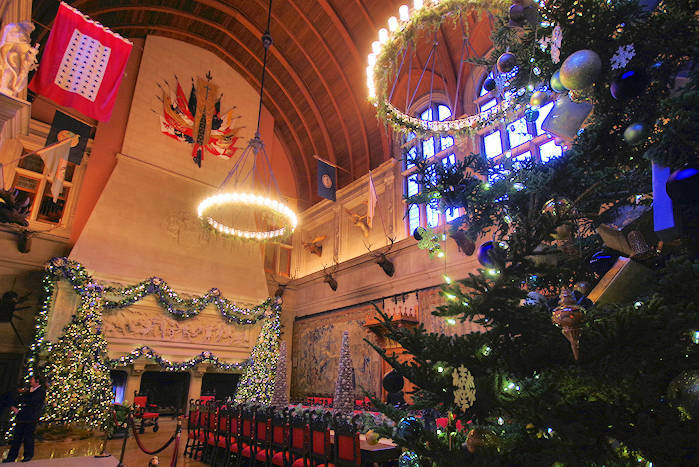 See our favorite events, festivals and art shows during the holiday season in Asheville and western North Carolina mountains, including many small towns and Biltmore Estate. The biggest event of the holiday season. See America's largest home decked out in festive finery. Candlelight Evenings are especially magical. See our extensive guide with tips, photos and details. Take a photo tour of our Top 12 Christmas Towns & Villages near Asheville, each decorated with plenty of festive things to do in the North Carolina mountains. Ride to the North Pole on the Polar Express Train at the Great Smoky Mountains Railroad to pick up Santa. It's fun for all ages. Departs from Bryson City. See our guide for all the details. Stroll through impressive light displays in the Arboretum gardens, especially designed to compliment the plants and trees in this beautiful setting. We are delighted to be a sponsor of this festive event. See things to do on the holiday weekend, including the best restaurants open on Thanksgiving Day. Kick off the holiday season in style! Find things to do and restaurants open on Christmas Day and week in Asheville and the surrounding mountains. Pick the perfect Christmas tree for your home at a "choose and cut" Christmas Tree Farm near Asheville. After you find your tree, they cut it, bale it and tie it on your vehicle. See our favorite farms. See the winning gingerbread houses and creations on display at The Omni Grove Park Inn, elaborately decorated for the season. Public viewing Sunday-Thursday except Christmas week. See our guide for all the details. Hit the slopes for plenty of winter of fun. Since we have the highest mountains in eastern America, you will find plenty of snow, either natural or man-made, for sking and snowboarding. Shop and dine in the beautifully restored and decorated historic arcade in downtown Asheville. Find a big variety of local shops and galleries and see gingerbread house creations in one of the first enclosed malls in America. Open 7 days. Hiking during the winter has many advantages - including better views thanks to leafless trees, few fellow hikers, no bugs, brilliant skies with more distant views and cool temps. 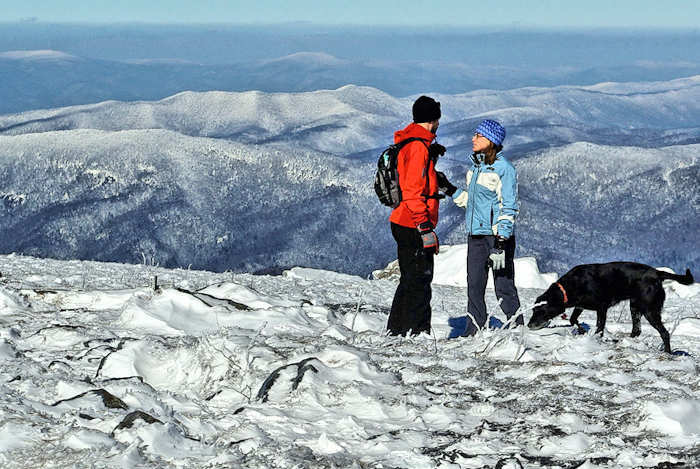 See our top places for winter hikes in the Blue Ridge & Smoky Mountains.